As I type this, the UK is basking in its first – and potentially only – heatwave of the year. When the summer comes along, many people scrabble around trying to find some fitting music; maybe some chilled out reggae or a moody up-and-coming singer-songwriter. Of course, it’s purely subjective what constitutes as ‘summer music’. 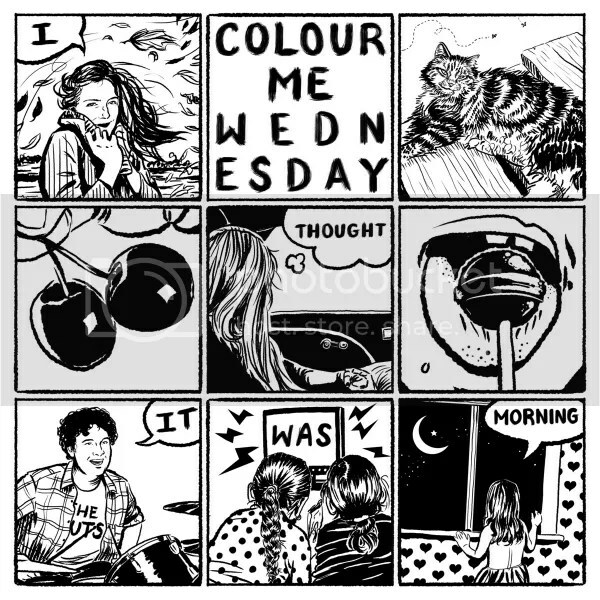 Colour Me Wednesday certainly tick all the boxes though – their music emanates a bright and carefree quality, yet behind the upbeat rhythms, there’s the sound of disillusionment and anger. It’s subtle, until you delve into the lyrics, and then it’s plainly obvious. Who am I speaking to and what do you do in Colour Me Wednesday? J: I’m Jen and I sing. H: I’m Harriet and I play guitar. C: I’m Carmela and I play bass. How did you decide on the band name? H: I pulled it out my arse and then made up fake reasons. I like Wednesday Addams though..! J: Usually one of us comes forward with an idea and the rest have to be optimistic and help add to it. We’re writing new songs at the moment and this is how we do it. Then we try and get a recording done as soon as possible even if it’s a low quality demo. C: Yeah one of us will write the skeleton of a song and the rest of us will chip in. Maybe we’ll try all sorts of ways for writing new songs though. And what about when it comes to writing lyrics? H: Sometimes I want to write in a more fictional and poetic way but I just end up writing about stuff that bothers me or I’ve experienced. I feel like loads of men can write in a way that’s like referencing history or characters and stories and I find myself wanting to do that too. But I weirdly feel too nervous to do that cos I feel pretentious or like I’m faking. Yet I like it when others do it? Maybe I’ll try. The process of categorising bands into particular genres and sub-genres really divides opinions. What are your views on it? And how would you describe CMW? J: I feel like I don’t have much awareness of how we sound to other people. C: It’s always harder to describe your own band than someone else’s. J: I feel like I want to make songs that are catchy and moving with lyrics that people want to read up on afterwards. C: I think it’s inevitable you’re going to categorise bands into genres. But everyone knows that it’s kinda loose, not a strict thing. H: Sometimes we get compared to bands we haven’t even heard before who then later inspire us. Veganism is obviously an important issue to the band. Do you feel that it’s hard to bring up veganism/vegetarianism without others trying to shut you up by using the stereotype that non-meat eaters ‘preach’ a lot? H: Well that’s what ‘I’m not coming to your BBQ’ is about haha. I wrote that song cos me and Jen were brought up vegetarian. But we never really talked about it socially in groups, yet there’d always be one meat eater in a social situation that always manage to steer it that way. Then you’d find yourself kind of lured into a trap of being called ‘preachy’ even though they were the ones shooting the questions at you. It was always a really frustrating thing. J: And the only way to get out of it would to pretend and be like “I don’t really care that animals are murdered”. H: Yeah they’d end up acting victimised by just the idea of us being bothered that they were eating meat in front of us. They wanted to feel that way and feel ‘oppressed’ by the presence of vegans/vegetarians. Its like mate, you go eat your burger I don’t care. I care more about what I eat. Another important issue for you, and for the whole alternative scene at the moment, is feminism. The rise of the ‘meninist’ and the vitriol received by female journalists is an ongoing cause for concern. Do you see it as some men feeling threatened by the current feminist wave/movement – or maybe something more severe than that? How do you see things progressing over the next few months or years? J: Meninism is nothing new. You can see propaganda towards the suffragettes that was almost identical. C: There’ll always be a backlash any time you have progress. J: I think its an obvious choice to be a feminist cos we’re not treated as equal. For me it goes hand in hand with my anti-capitalism. But as with that, people are afraid of change. Some people say that trying to discuss sexism and feminism at alternative/punk gigs is like preaching to the converted, while many others would argue there is still a long way to go – what are your views? What would you like to see more/less of on the ‘scene’ and how can we go about doing that? H: I have a love hate relationship with the scene. I can still find some of it quite bro-y especially at the bigger gigs. When I’m there I don’t feel necessarily ‘in’ the scene, I feel on the edge of it looking in at lots of bearded fist pumpers haha. But the smaller ones there can be a bigger sense of community and respect. Especially when there’s a larger balance of women in the room. J: I like the queer and feminist gigs specifically cos outside of those small movements punk and rock is quick to erase the contributions of women. They’ve become male genres despite the fact that many of the originators of rock n roll and punk music were women and specifically women of colour too. So to fit into punk or rock we’re made to feel we have to aspire to a male aesthetic or a style that makes men feel comfortable to be good. Like ‘you would be successful if you were more like this man that was successful’ forgetting about all the female punk and female rock n roll artists who weren’t played on radio or listed on ‘greatest punk icons of all time’ – basically just forgotten about. H: I think the punk scene still has a way to go with intersectionality too. It has potential and the ideas are there…but there still isn’t enough people/women of colour in the scene. I’m not sure how we’d change this straight away and it could be a whole range of reasons but it definitely needs to shift. Women of colour need to be celebrated more and embraced by the punk and indie scenes. C: Even when you’re preaching to the converted, if you’re living the rest of your life in spaces where you don’t feel like you see yourself represented then it can be really strengthening to go to those kind of queer and feminist punk gigs… but in mainstream punk I don’t feel as represented. So the more noise you make about it then it’ll eventually start being more visible in the mainstream shows as well. You’re based in London and play a lot of gigs in the capital. Do you manage to get out across the country much? Have you played on mainland Europe (or further afield) at all? C: To be honest we really like playing up North, and we enjoy it more than London cos London is more spread out and there’s so many things going on. Also venues are always closing down here. Whereas up north there’s a better scene. So yeah, we like to play around the country. Then last year we went to America for a month and played the East and Mid-West with Spoonboy. H: It was GREAT! I loved it and want to go back. New York Pop Fest and Plan-It-X Fest were especially super fun. I miss it. J: Yeah I didn’t think I liked travelling. But I realised I don’t like travelling for leisure as much I like travelling as a musician, cos of the sense of adventure and not feeling just like a tourist. Now its summer again I wanna get out there and tour. You run a ‘West London DIY Creative Collective’ called Dovetown. What does that involve? H: Someone recently described ‘Dovetown’ as the “most exciting thing in Rock n Roll” and I AGREE! Haha. Well it is the most exciting thing in West London. There’s no scene here, most of the punk shows happen in South London. Back in the 70s there was more going on in our hometown and surrounding areas – The Ruts and a bunch of old school punk bands used to play at the local university – Brunel and in Southall too. Now the scene has fizzled out and we’re the only thing left and we’re trying to do something. The problem is it’s still hard accomplishing anything creative in our town, the council try and stop you and there aren’t really any music venues. But we have hope. Dovetown is a bit of everything really. 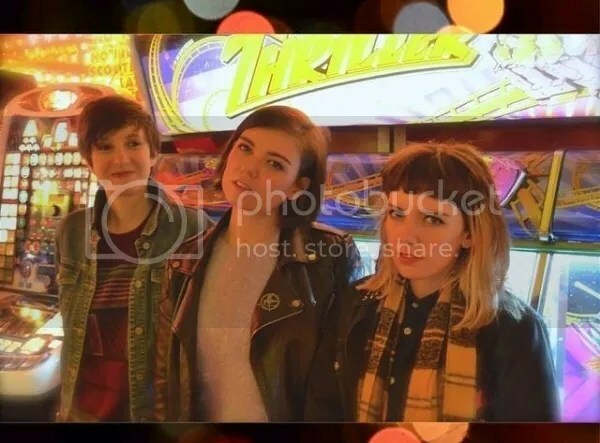 It’s mainly Colour Me Wednesday and The Tuts. But Perkie, Daniel vs the World, Ay Carmela, Emma Kupa and some other bands have been involved. Whether they’ve done a live video here, recorded here, practised here, etc. What we do is book occasional shows, make videos, we have an illustrator called Akbar Ali…all sorts! We have no limits. Just a big creative hub with a strong work ethic. J: I don’t think DIY is about doing things that get you ahead. It’s about making things possible for other people too. And I feel privileged to know so many talented musicians. I like the idea of us all collaborating so we don’t need horrible promoters or major record labels or booking agents to do this stuff for us. Because I’ve met so many people who are really talented but when it comes to promoting themselves or recording everyone needs a bit of help. So the more minds put into something the better. It can be quite lonely being a musician if you don’t hook up with other people- who wanna help you and don’t just wanna exploit you. C: Not everyone is good at everything, so being DIY means we’ll get more done as collective community cos not every band can do everything for themselves. Some people are better at videos, some better at artwork. That way we’re less reliant on having to go outside of the scene or pay other external people and instead pay each other. J: Like our illustrator friend Akbar Ali. We went to school with him, he’s an incredibly talented working class guy. And we get to pay him to do our artwork. H: And now loads of our friends’ bands all come to him for artwork designs. He’s become pretty popular. Do you have a band favourite TV programme or film that you like to quote a lot at practices/on the road? H: Haha. Me and Jen quote Seinfeld quite a lot. J: The adventures of Pete and Pete, The Simpsons. Carmela’s a cyborg and doesn’t watch TV. She was only just switched on and hasn’t absorbed much human culture yet. What other UK bands are worthy of praise right now? J: The Tuts, Doe, Wolf Girl, Daniel vs The World. H: Emma Kupa, Mammoth Penguins. C: Spook School, No Ditching, Martha, Faith Taylor. This entry was posted in Interviews and tagged colour me wednesday, dovetown, feminism, i thought it was morning, indie pop, indie punk, interview, pop punk, veganism. Bookmark the permalink.